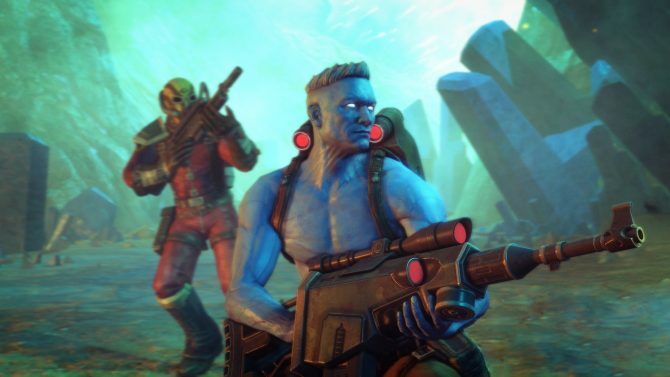 Rogue Trooper Redux brings the classic game back to life with updated visuals for a new generation of gamers, but only established fans might find enjoyment out of it. It seems that with each generation of new console hardware comes a large batch of remastered versions of old games. This is even the case for the niche cover-based shooter, Rogue Trooper, which released across multiple platforms over ten years ago. Sure, the game did well, but I never imagined that I’d ever be playing a remastered version of it during this hardware generation.With that said, Publisher Rebellion brought the title back to life with Rogue Trooper Redux. The developers aim to provide a more modern experience for new players as well as returning fans, but they also want to make it clear that this is a true port of the classic game — that is actually what sets it apart from anything that fans of this genre are picking up today. 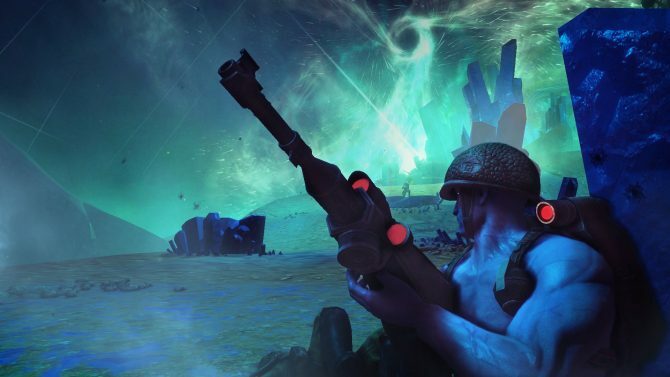 Rogue Trooper Redux’s story doesn’t waste any time with throwing the player into the action. The game begins in the middle of war on the Planet called Nu-Earth between the Norts (normal humans) and the Southers (genetic humans who are blue and immune to all poisons and diseases). The player will play as Rogue, a member of the Genetic Infantry for the Southers. Right away, the story introduces the underlying theme of racism and the fight for survival of one’s race. This makes it powerful enough to warrant one playthrough, but lacks a defining moment that stands out as a scene that must be experienced. Instead, the game relies on multiple small moments that add up to an overall good story. 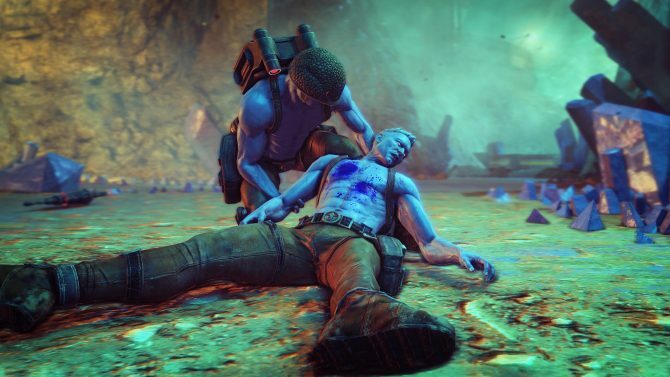 What I enjoyed most about Rogue Trooper Redux’s narrative is that it reminded me of 80’s Arnold Schwarzenegger action films, where the story contains an easy to follow plot with over the top action scenes, but nothing groundbreaking. Rogue Trooper Redux is a third person shooter with an upgrade system that depends on collecting scrap from dead enemies. This is also the only way to purchase ammo and grenades, which adds a bit of complexity to the game and makes you think twice about running and gunning into situations when you only have one clip left. Although this system was new at the time, it won’t provide the deep character customization system that some gamers look for nowadays. However, I didn’t have a problem with how easy it is to learn these systems because it made my times spent in menus minimal. That being said, you’ll be entering this menu often and it might hinder your action experience. The game also has some stealth mechanics implemented that allows the player to sneak up behind an enemy to go in for a quick execution. Every time this is achieved a short animation will play. Being a product of its time, if an enemy spots you during this animation they will begin firing while you’re taking down an enemy. This didn’t happen too often, but it is something that I remember happening a lot in games from this era and it becomes something you take into consideration when approaching an enemy for a stealth kill. 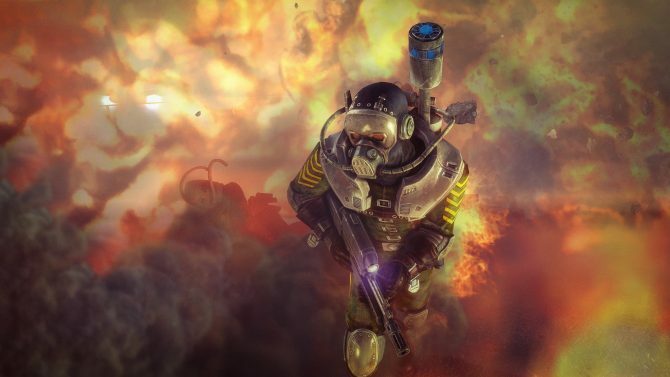 Rogue Trooper Redux has some controls that will take some getting used to for newcomers. Everything from melee to crouching uses this classic spin on a modern control scheme that I don’t think I have ever used before. I did have some problems getting the hang of this at first since it was tough for me to figure out how to throw a grenade properly and also how to exit cover, but after awhile I felt comfortable with it. Returning players will find the most fun with the controls while newcomers who are willing to give this game a chance will be begging to search for a the options to change them. The AI enemies in the game are almost laughable and echo the statement about this game being a product of its time. I can’t remember the last time a game allowed me to snipe an enemy while his partner is standing right next to him and all the partner does is get a little confused before he moves on with his day. In a way I felt like I was cheating myself out of an experience when I would take out everyone before I even walked into the area. Additionally, Rogue is equipped with some pretty interesting add-ons, such as the ability to turn his gun into a turret and activate it when enemies attempt to ambush him. There’s also different types of mines and grenades that can be equipped. The updates in Rogue Trooper Redux are purely cosmetic apart for the higher difficulty settings. This does make the game look better, especially when comparing it to the Xbox and PlayStation 2 versions. However, it made me wish that this version of the game would have just been included with a sequel or a complete reboot of the title. The environments are constantly changing throughout the campaign and I was never bored when playing through any particular level. The issue that I found during missions is that sometimes objectives would be repeated and I felt like this was just done to add padding to the game’s runtime between destinations. There were other times where the objective wouldn’t be explained clearly and I would just be fighting against wave after wave of enemies when all I needed to do was press a button. 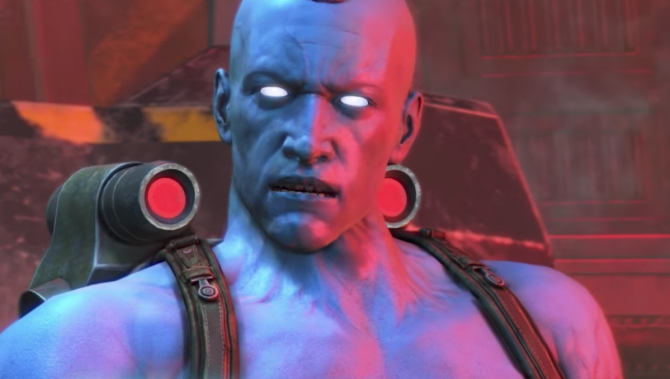 Rogue Trooper Redux can best be compared to looking into a time capsule and that’s probably the best part about it. Again, it’s a product of its time which makes it difficult to criticize for using systems that, ten years ago, were a new and exciting addition to the third person genre. Sadly, this game just might be too slow for modern fans of the genre to enjoy, although older gamers might get a good taste of nostalgia out of it. 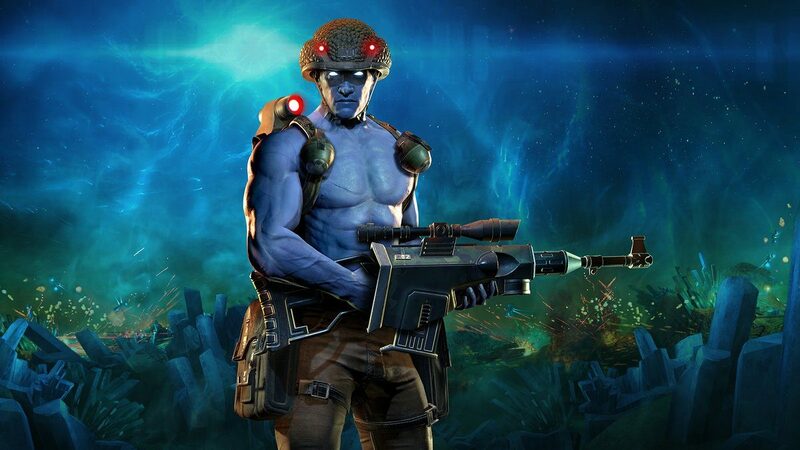 Rogue Trooper Redux might have been a strange game to remaster, but I had a decent time playing through the story again. I enjoyed taking advantage of the limited enemy AI as well as taking them out with my arsenal of gadgets. Although I would have preferred a reboot or sequel to the series, this provided a nice trip down third-person shooter memory lane, but that might not be enough to gauge enough interest from modern gamers.